It’s not just a variety show; there’s a story that runs the length of the program. Chewbacca and Han are running from the Empire, trying to make their way to the Wookie homeworld of Kashyyyk so Chewie can be with his family on Life Day. But this kind of spacefaring excitement is not the stuff of variety shows, so we’re quickly introduced to the aforementioned waiting family of Chewbacca: his wife Malla, his dad Itchy, and his son Lumpy. They don’t mention whether these are their full names or just their nicknames, so for all I know they’re actually named Mallacca, Itchacca and Lumpacca. I guess we’ll never know… unless Chewie’s family is in The Force Awakens! Oh, I sure hope so! I have to know if Lumpy outgrew his lumpiness! 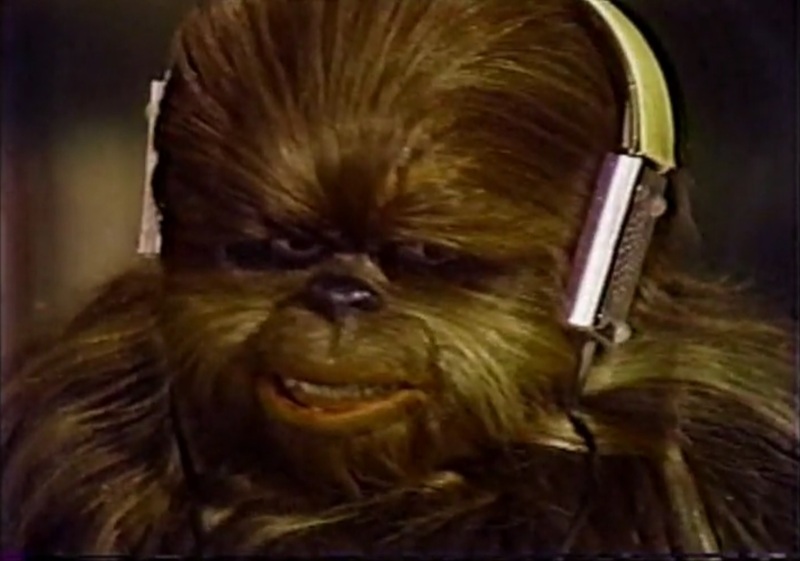 And hey, since they’re trying to milk Star Wars for all it’s worth expand the galaxy, they could do a Chewbacca solo film where Lumpy confronts Chewie about his abandonment issues because Chewie was always hanging out with Han! Disney, I’m available! OK, so where was I? Oh yeah, Chewie’s family is waiting for Chewie to arrive for Life Day. 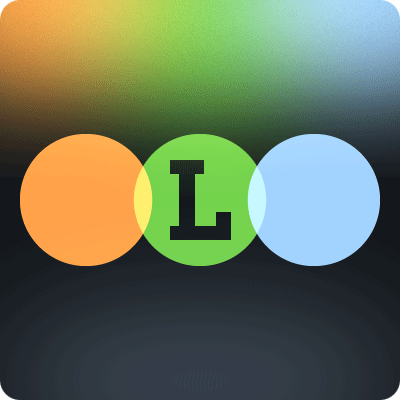 And then… well… hmm, that seems to be the whole story! This manages to hold together a two-hour long TV special (with commercials) by being very prescient of our current content-consumption obsession and having the characters watch a lot of stuff on their vidscreens. Some of it is your standard vidcalls to Luke and Leia, cartoons, and cooking shows (which made me think about all the hair that must end up in Wookie-made food), but then there are things like the hologram circus and Itchy’s virtual fantasy girl to let you know the writers weren’t asleep at the wheel. No, they’re definitely trying to make the show very “far out” and “out of this world,” and they do succeed on this front. 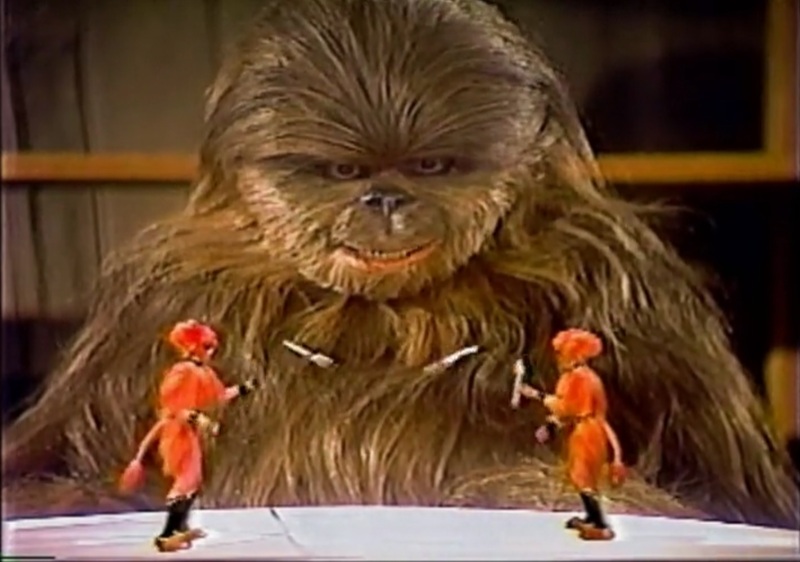 Not necessarily in a way that you could call “good,” but I’m fairly confident in saying that there’s never been anything quite like The Star Wars Holiday Special on TV, before or since. Some — many, even — would say this is a bad thing, but to be completely honest I liked this damn thing quite a bit. For one thing, almost all the main cast of Star Wars is here, and any fan can’t deny the sheer novelty of seeing them together in character, in 1978, in scenes you’ve never seen before. Did I need to see Princess Leia sing the Life Day song, lulling Chewbacca into a psychedelic flashback of scenes from Star Wars? N — actually, yes, yes I did. But this moment and others like it really drive home the feeling that in order to enjoy The Star Wars Holiday Special, you really have to enjoy B-Movies or other strange, cult entertainment. Don’t come for the deft storytelling, come for the hefty portion of WTF served up on a hairy Wookie platter. I watch a lot of B-Movies, so I’m always aware how razor-thin the line between “dumb” and “dumb that transcends its inherent dumbness and works” is. The Star Wars Holiday Special proves just how ridiculous and horrible Star Wars could have been. It’s a testament to the fortitude of George Lucas and everyone involved who crafted the original Star Wars film into the thrilling piece of entertainment it is. Just a couple of wrong choices and BAM, hyperspaced right into Quadrant Dumb. Thankfully in the case of The Star Wars Holiday Special, they went so far off course that it can’t help but entertain in a wonderful, “What were they thinking?” manner. The Star Wars Holiday Special is an ultra-dated oddity, but it’s so strange and varied that it’s actually fairly entertaining. Once you see it, you’ll know why it was never rebroadcast, but I’m still surprised it hasn’t made an appearance as a bonus feature in a Star Wars box-set. 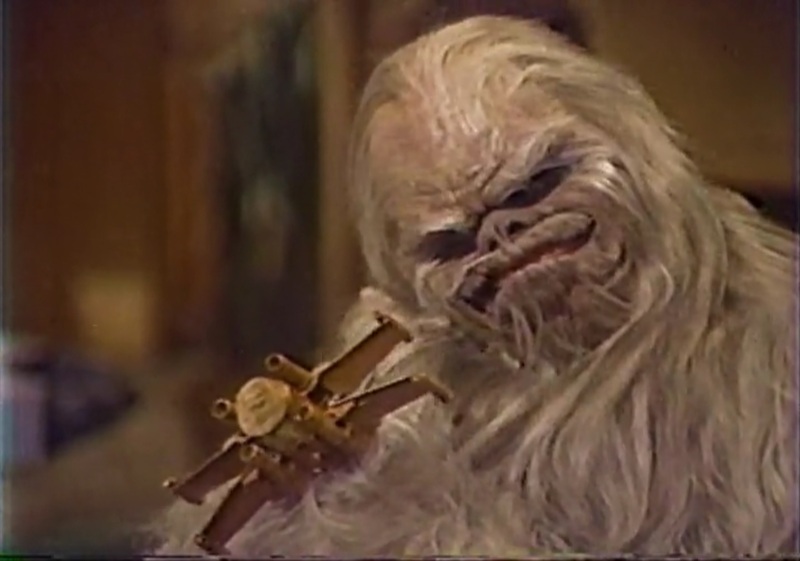 It’s not all WTF weirdness either, The Star Wars Holiday Special is notable for its introduction of a number of great things into the Star Wars galaxy, most notably Boba Fett, keytars, Jefferson Starship’s pulsing rock energy, and giant mutant rats! It also kind of presages those horrid, yet hilarious Disney World live shows with Chewie Axl Rose and Ewok Slash rockin’ it to Welcome to the Jungle, and that Kinect dancing game. The special also speaks to the immediacy and the intensity of the Star Wars phenomenon. How many original films get a TV special one year after their release? It’s nuts! 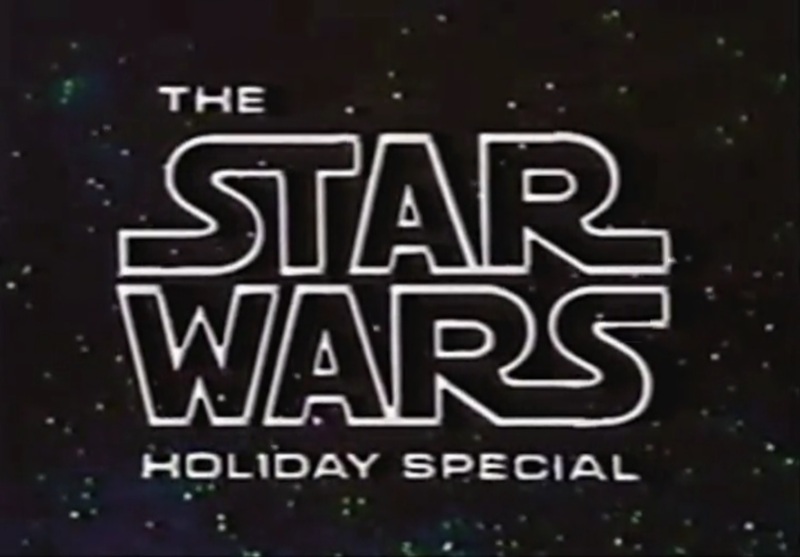 The Star Wars Holiday Special is definitely better than its reputation. It’s packed full of weird, crazy ideas and more Wookie grunts and growls than you ever wanted to hear — and they even managed to get a Wilhelm scream in, too! It’s pretty hard to describe, but if I had to boil it all down to one sentence: Better than the prequels.